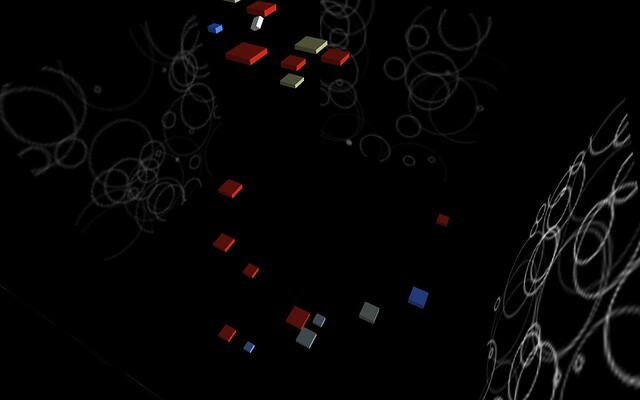 Here shows animated blocks “living” within a strange limited artificial world which cycles through different phases “controlled” by the pattern of the blocks’ movement. The initial phase shows “intelligent” incomprehensible block movement in a relatively safe state where the surrounding walls’ blue ripples represent a shield force that protects them from harmful particles. After a while the blocks get tired and feel no motivation to continue and so stop. They rest. But as a result, slowly the blue ripples stop appearing on the surrounding walls. Then the walls show particles hitting them and sometimes those hits correlate to a hit of some central blocks. A hit block will flash and resist the disturbance. After a time the collective decides enough is enough and begins a new phase of synchronized movement in a kind of sine wave pattern. Eventually this succeeds in restoring the surrounding walls’ protective powers and the blocks regain autonomy. They regain their complex coordinated movements. Until the cycle repeats again. The speed of the blocks “inside” can be controlled by clicking and dragging the mouse or by touching the screen and dragging left and right.